Dr. José Luis Cruz, president of Herbert H. Lehman College, The City University of New York, delivered testimony this morning to the U.S. House of Representatives Committee on Education and the Workforce that emphasized the need to fight inequities in higher education and explained how Lehman and other public two- and four-year colleges are creating equity-focused solutions and changing lives as a result. 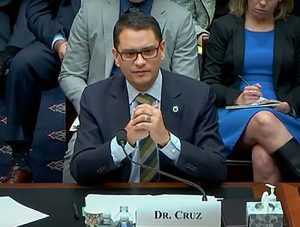 President Cruz was invited to offer his testimony at a Committee on Education and the Workforce hearing on “Challenges and Opportunities in Higher Education.” The committee is chaired by Congresswoman Virginia Foxx from North Carolina. While acknowledging the importance of the nation’s postsecondary education system in maintaining economic growth and prosperity, President Cruz pointed out that higher education “is far too inequitable,” with low-income students enrolling in college at lower rates than high-income students did four decades ago, suffering low graduation rates, and racking up disproportionate debt. President Cruz noted in his testimony that 50 percent of Lehman students have a household income of $30,000 or less; 80 percent are students of color; and 41 percent speak a language other than English at home. Yet a recent study found that many mid-tier public colleges like Lehman, which consistently move low-income students upward into higher income levels, have the highest “mobility” rates in the nation. Lehman’s role as a transformative change agent for students is accomplished mainly through three actions, said President Cruz: creating alternate and well-coordinated pathways to increase student success; improving graduation rates and reducing the time it takes students to earn a degree or certificate; and establishing public-private partnerships in leading edge workforce development areas. Although an equity-focused system like Lehman’s is making a difference, President Cruz suggested that other equity-driven instruments and policies need to be implemented nationwide. In particular, President Cruz mentioned renewed state investments in higher education, increased Pell Grant funding, strengthening the Direct Loan program, and utilizing actionable data for institutional improvements as a means toward helping underserved students, and combating higher education inequities. “I believe that we can and must do a better job of building a system that sustains rather than erodes opportunity,” said President Cruz in closing.